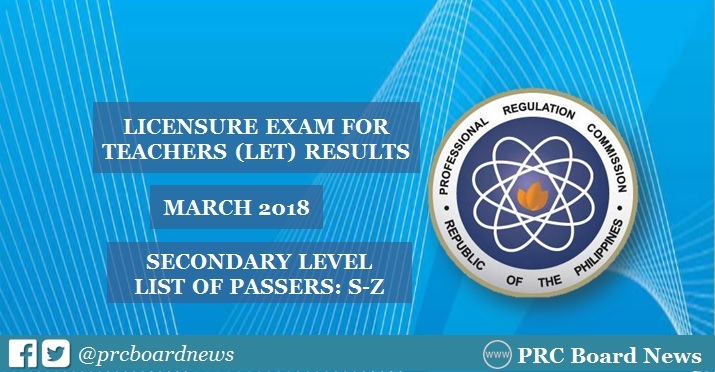 The Professional Regulation Commission (PRC) releases results of March 2018 Licensure Exam for Teachers (LET) or teachers board exam in two (2) months after the exam or on May 23 (Wednesday). Check out on this page for Secondary level passers (S-Z Surnames). UPDATE: PRC announced that 22,936 secondary teachers out of 76,673 examinees (29.91%) successfully passed the LET. It is further announced that 15,035 passers are first timers and 7,901 are repeaters. PRC and the Board for Professional Teachers (BPT) administered the examination in at least 20 test locations nationwide: Manila, Bacolod, Baguio, Cagayan De Oro, Catarman, Cebu, Davao, General Santos, Iloilo, Kidapawan, Legazpi, Lucena, Occidental Mindoro, Pagadian, Palawan, Romblon, Rosales, Tacloban, Tuguegarao and Zamboanga. According to PRC Resolution No. 2017-1068, which deals with the 'Schedule of Licensure Examinations for Year 2018, the target release date of March 2018 LET result on Tuesday, May 22, 2018 or in 37 working days after the exam. Other sources hinted that LET results will be released on the following day, May 23. Barring unforeseen circumstances, we will welcome this week the new roster of educators and professionals. Congratulations to all the LET passers! Nowadays there are authorities in each work like masters, columnists, painters and various more who directly off the bat get getting ready about their work. Furthermore, a while later visit this website they continue doing their picked work who the life as a calling and get wealth. Our expert and experienced know that what exactly students want. That's why this website is here for those students. Check it now. http://www.mbapersonalstatement.org/how-to-answer-harvard-business-school-essay-prompts/ and let us know about it. The ideas of writing service for law statement is here. Our professional writers come from a wide variety of information and they have vacancy to do better. I think, in past period understudies were standing up to hardships to get creating organization in light of the fact that there wasn't web and nonappearance of https://www.capstonepaper.net/10-best-aviation-capstone-project-ideas/ significant worth writers. I am sprightly to be the bit of this time as I am benefitting as much as possible from my understudy life period by getting particular new things like web creating organization. This is absolutely good board exam results news services and here I got result list of board exam. This online result services should helpful for students. Here you can get additional info about our statement of purpose writing services. Thanks for sharing wonderful news service.